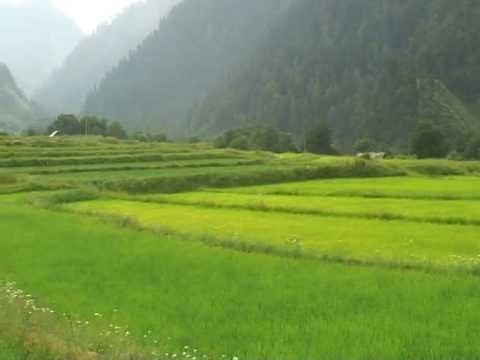 J&K in the past was predominantly agricultural State. Immediately before 1947, near to 90% of its population lived in villages & depended on agriculture. Under Dogra Rule, “in Kashmir the land [belonged] to the Ruler, the cultivators [were] his servants”. 1 In Jammu, proprietorship in lands was claimed by the Dogra monarchs as hereditary, in Ladakh & Batistan it was claimed by virtue of conquest of those territories & in Kashmir it was claimed on the ground that Kashmir was purchased by them through their founder, Maharaja Gulab Singh, from the British for 75 lakh rupees on 16th March, 1846 vide “disgraceful transaction” 2 of notorious Treaty of Amritsar, also called the Binama Amritsar . The peasants who cultivated lands had no proprietorship rights at all & so sale of lands by them was “null & void” in the eyes of the Darbar. They were working like “coolies under a management closely approximating to forced labour” with the Darbar as the “farmer”. 3. The proprietorship of jagirs could be only conferred by the Darbar by sanad /official document & the grantees were invariably the relatives, courtiers, & top officialdom of the Darbar. The last one included near to all Kashmiri Pandits. The grantees were called Jagirdars & mukarari-chakdars. The appointment of a British Resident in Kashmir was a necessary preclude to the implementation of wide ranging reforms in the Dogra State. 4. Whatever the intrigues & politics played by the British behind installing Pratap Singh as Ruler of the State, the British intervention proved blessing in disguise for the Muslim subjects of Kashmir. 5. With the establishment of permanent British Resident in Kashmir in 1885 during Pratap Singh’s reign, the British Resident constituted, controlled & headed the Council of Regency through which the British exercised their assertive control over the Dogra administration who felt compelled, thus, by the British to undertake reforms in land administration under the aegis of their two expert settlement officers, Andrew Wingate & Walter Roper Lawrence, one following the other in settlement process. The British intervention for reforms, which was claimed on behalf of the Muslim subjects of Kashmir ruled by Hindu monarchs, was stated to be “long delayed” or “so urgently needed” that were to be “no longer delayed” then. 6. So, it was Andrew Wingate who for the first time in his report to the Darbar sensitised it that without support & sympathy of the land cultivators, no settlement policy of the Darbar could last long. He recommended that the peasants’ “assistance & sympathy can only be won by conferring upon them possession of the land they till”, that is, their hereditary occupancy rights (Morossi Mustakil Kashtkari) in the land against the ownership of the State/Ruler, 7 to be acknowledged which was endorsed by his successor-in-office, Walter Roper Lawrence 8, who , however, disagreed with Andrew Wingate as far as right of alienation of occupancy tenancy [to bone fide cultivators even, as was recommended by Andrew Wingate] was concerned on the ground that powerful & greedy Lamberdars, Jagirdars & Chakdars through their middlemen, and corrupt [Pandit] revenue officials, would easily exploit the improvident & illiterate cultivators of Kashmir valley. So, Lawrence stated that their occupancy rights in the land shall be inalienable by sale, mortgage or lease, etc. 9. Ultimately, under the persuasion of British Rulers and on the strong recommendations of their two experts, afore-named Principal Land Revenue Settlement Officers of the State, the Maharaja Pratap Singh in 1895-1896 formally & legally recognised the occupancy rights (Mustakil Kashtkari) of the peasants in the land. The cultivator who was recognised by the Darbar as lawful occupant was called the assami which was decided on the basis of his hereditary cultivation rights of the land which (rights/haq e assami) were called miras, the holders as mirasddar and in the settlement mirasddars were entered as assamis. The undisputed cultivators were entered without any hesitation as assamis, where their cultivation rights were disputed, the settlement officer was directed to enter their names as assamis after an inquiry only. We have noticed above that except in the Srinagar city & major towns where sale & mortgage of land was already allowed, the peasants or zamindars of Kashmir in general did not have any proprietary rights in the land as ownership was directly vested in the State represented by Dogra monarchy. This position continued till 1931 when most significant event in the “freedom struggle” of Kashmir took place on 13th July, 1931. The martyrdom of 22 innocent Kashmiri souls gunned down by the Maharaja’s sepoys induced Kashmiris to hit the roads demanding for their basic rights & prompted joint leadership of Kashmir to mount pressure on the Maharaja, among others, for bestowment of proprietary rights on the suffering peasantry of Kashmir. The Maharaja conceded to the said recommendation of Glancy Commission by bestowing on all peasants of Kashmir, who till then had been having only occupancy rights, full proprietary rights in the land, the ownership whereof was till then vested in the State. In Jammu province too, the occupancy tenants wherever existed were granted proprietorship. 18 However, as suggested by the Glancy Commission, two major measures to prevent interests of agriculturalists were adopted by the State by passing the Land Alienation Act, 1933 & the Right of Prior Purchase Act, 1937. The first statute provided that a peasant can alienate land only upto 1/4th of the holding to an agriculturist only & the restriction was to remain for first 10 years of the conferment, while the second statute recognised prior right (pre-emption) of agriculturists of purchasing agricultural land.